Gigi before and after the 3D printed beak was implanted. Concept Laser says that its Mlab Cusing R 3D printer was used to 3D print a titanium replacement beak for a wild macaw, which lost its beak due to poor conditions. 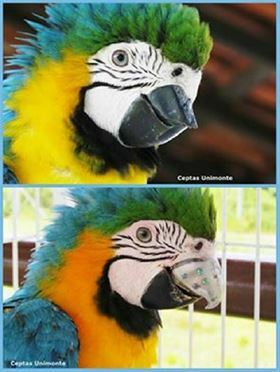 This unusual prosthetic saved the bird (named Gigi), as macaws are unable to eat solid foods without a beak. Macaws use their beaks to open seeds and break other hard shells, meaning that their beaks need to be extremely long-lasting and strong. As a result, the team decided to use the extremely hard material titanium, additive manufactured on Concept Laser’s smallest printer. The 3D-printed prosthetic was secured in place with bone cement and orthopedic screws. The successful operation took place on 18 February 2016 at the Animal Care Center in Ipiranga, near Sao Paulo, Brazil.